This is our main event and something our volunteers look forward to each year. 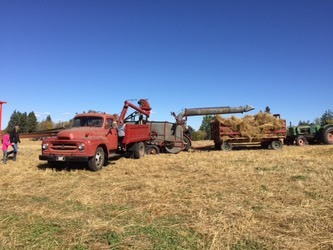 We start off with an Old Time Church Service (all are invited to attend) and then the men head off to the field with the vintage farm machinery. At noon the other volunteers begin demonstrations such as blacksmithing, ice cream making, and more. 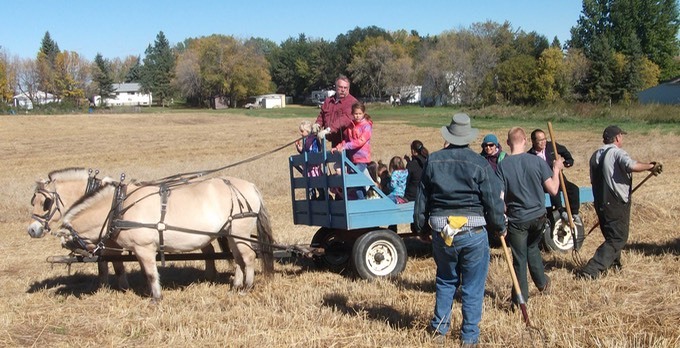 There is plenty to do for the whole family, including sparkle tattoos, a balloon artist, wagon rides, live music and old time games. Kids are invited to do a pumpkin patch craft and try an old fashioned cookie in the Pahal House. 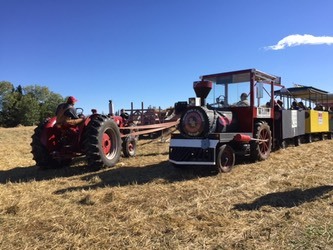 This year we have a display of miniature machines from the Alberta Metal Enthusiasts Network, other groups will also be demonstrating pieces of machinery, including a working grain grinder. As always the Tea House is serving up some delicious lunch and pie and the Dawgs Hunger Hut concession will be providing something tasty for the younger visitors.